Working the layers – winter cycling in full swing! We woke up to -15 with windchill in Toronto this morning, and although the roads are dry, it’s understandable that this would put some folks off riding to work. Not me my friends! Years of outdoor play and Canadian-ness have taught me a few things – the layering of clothing being one of the most important. 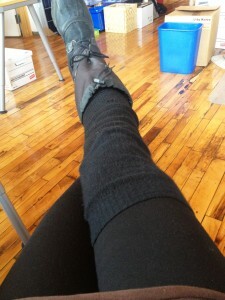 Warm Sorel boots with felt lining. 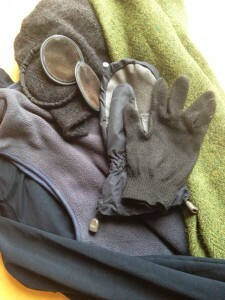 TIP: On days this cold, I find that having the thin gloves under my mitts allows me to more easily lock up my bike. I can remove the mitten and still have enough protection from the cold to use my fingers for fumbling around with keys & lock. Comments Comments Off on Working the layers – winter cycling in full swing!